“the great gift of hindsight”. It is very easy to tell other people what’s going to happen, what has happened, how things will get better. In fact when it comes to death and sadness there is no shortage of ‘things will get better’, and much of the time this is exactly what literally no person ever wants to hear in that moment. What I like about Nicola is her as person (obviously, as we’re friends), and her personality comes through in her book. She’s kind and she’s caring, she holds the hand of the bereaved and gently takes them through what they can expect, or have already been through. 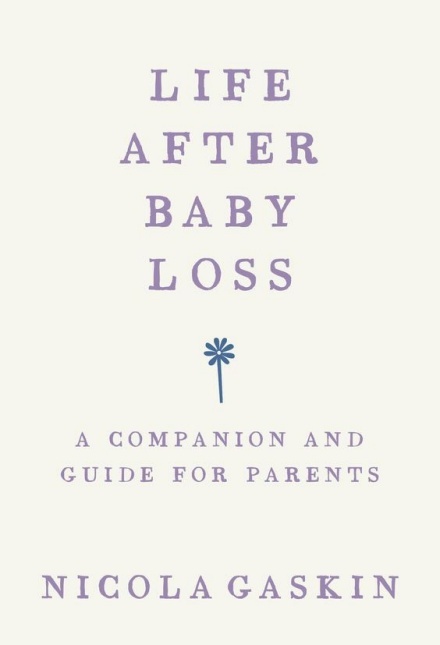 She encompasses, to the best of her abilities, every type of baby loss, from early miscarriage to older children (though she does stop at “neonatal” as a title the sentiment is still there and is clearly there through the writing – healthy and those with illnesses included) which is not the easiest of tasks. When we move onto heartbreak Nicola touches on what one can do in the early stages of grief, and it culminates in, pretty much, do what feels right. Each chapter ends with a small bullet point list of helpful tips that act as a summary. They are helpful reminders that one can pop back to when things are getting particularly heavy in life. At some points I felt as if I was too much being told what I was feeling, and it would have been nice for Nicola to have used her own emotional experience more and allow the reader to relate to it themselves. However, her use of her own experience is blissfully far from gratuitous, it is very much a book to help rather than a book to talk about herself under the guise of helping which so many seem to be. To read this book you do not need to know who the author is. I appreciated her outlook on grief and the grieving processes, especially in the chapter entitled Everlasting Grief, a part of the book fitting for those having experienced a loss and those supporting others through it. “I don’t really believe in a ‘grieving period’, in fact I think we should rub this phrase out of the Western dictionary” she says, and emphasis on the Western because, if you didn’t know, Nicola is a practising buddhist. To see more of this side of her, to get this perspective on her journey and overall outlook, would have been nice. Nicola follows this with an in-depth dissection of jealousy in grief, something which we can all say we have felt, whether we admit it or not. This I think is one of the more difficult parts of grief and one of the more difficult to understand as an outsider. To be given such validation and such emphatic Yes, Me Too! I Know! will help others reading it without a doubt. During my own early months I think this was where I wanted the understanding - I wanted someone to let me be angry and jealous but to help me rein it in. Her chapter on trying to conceive, I think, embodies what I would have loved the entire book to be like. A little more grittiness, more rawness, and yes perhaps a little more bleakness, if baby loss is not bleak then what is? All in all it is, as described and advertised, a gentle companion. It gently talks one through what to expect, what you may feel, how best to feel and act upon it (spoiler: literally any way you feel like). The thing that sticks out the most for me, however, is the intensity on which the book focuses on loss, grief and you. There is little to no mention of reliance on a partner, or on family and friends, it is not uncommon for those three relationships to break down under such duress and to be constantly reminded is hellish. This book aims to make one look inwards. Focus on yourself, take care of yourself, and all will begin to shift back into place.